Hi everyone! Sorry for being away for so long. I have had some personal things waying heavy on my heart and mind lately. I hope that now that I have found peace that I can get back on track with everything. I would like to thank MadAboutBooks18 at A Book Paradise for nominating me for the Liebster Award. This award was created to help recognize new bloggers and is passed along from blogger to blogger. 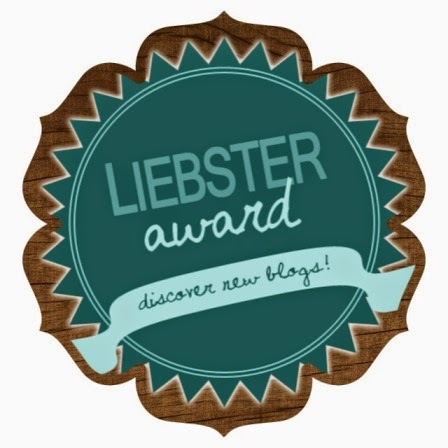 You can click here (Liebster Award) to learn more about this award. 2. Answer the 11 questions that the person who nominated you asked. 3. Nominate 9 bloggers with less than 300 followers and leave them a comment letting them know they've been nominated. 4. Ask 11 new questions for your nominees. 5. No renominating the blog that nominated you! 5.) I have very few friends but the ones I have are true. 2) Which one of your favourite characters would you choose to be and why? I would love to be her because of her courage and her heart. 3) What is your favorite post to write about? As always my favorite post is my reviews. I hope to one day get into interviewing. 4) Do you have any bookish pet peeves? 5) When did you become an avid reader? I became an avid reader (well a reader period) this year. My man saw me reading on the computer and decided to get me a Kindle. Since then I have not been able to stop. 6) How do you organize your bookshelves? At home I have no bookselves yet but you can always check out my shelves at goodreads.com. I am always rearranging them and adding to them according to how I feel. 7) Do you write stories or books? If so, which authors influence your writing? No I do not right. Could not write if I wanted to ( I stink at English). 8) How many book boyfriends do you have? I have 2 book boyfriends Four from Divergent and Aiden from Into the Veil. 9) Which fictional character do you most relate to? So far from what I have read I relate more to vampires because of their passion, their thirst for blood and there protection of their loved ones. 10) What are some of your favourite TV shows and why? My faviorate TV shows have to be Bones and Law and Order: SVU because of the crime. I also love Supernatural Sam and Dean are so hot. 11. )If you could turn back time to one memory in your life, what memory would you choose and why? If I could turn back time, I would go back to the day I met my man. The reason is because it was one of the times that I was truly happy. 2.) Why do you love to read? 3.) What is your favorite genre? 4.) When did you fall in love with books? 5.) Paper back or ebooks? 6.) Where do you like to read? 7.) What is your favorite book and why? 8.) What do you do when you are not reading? 9.) What about a book makes you choose it? 10.) What is your favorite movie? 11.) If you were to write a book what would it be? Thank You for stopping by hope to be getting back into the swing of thing. See you again soon. Wow, thank you so much for the nomination, Cynde!! I am happy to accept it, and will be sharing my post soon :) I enjoyed your post, and your blog! Thanks again, and have a great day! !